but I realized I didn't have a long enough zipper for the inside pocket so I'm stalled until tomorrow. This is a bag my godmother commissioned and it's WAY past due. I think I just got sick of this pattern (Sweet Harmony by Amy Butler). I've done it so many times I don't need to look at the instructions anymore! 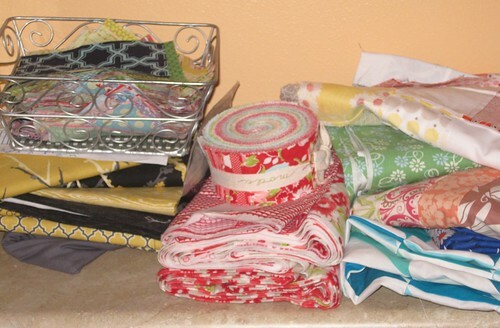 This stack includes a quilt for our bed per my hubby's request of the Aviary 2 fabric (not exactly my taste, but if it'll make him happy! ), a Bakeshop project, a trial run of my Bakeshop project, my Katie Jump Rope Kite quilt, the squares for my Warm/Cool QAL, and my blue/green HST quilt. Whew! I just go with it... you know, work where the mood strikes... it sometimes works, and sometimes just feels overwhelming! I wanted to make a Sweet Harmony bag; I guess it's not too hard then huh? This is so unlike you! 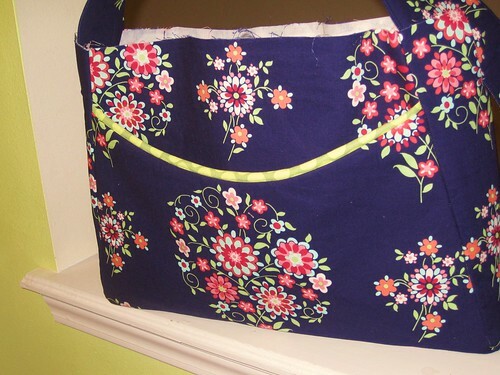 I am focusing my summer sewing efforts to tackle a good portion of my WIPs (in the back of my mind I had your sewing style in my head of not having any WIPs). I am sure that you will get these WIPs taken care of in no time. Good luck! geez woman! that's a whole lotta stuff. Can't wait to see what you make for the bake shop! Wow, that is quite the pile! I think when you finish up one thing on your list, it gives you energy and inspires you to start on the next thing! Hopefulyl you get one item knocked off your list and will start to feel like you aren't drowning in WIPs so much! Well, just give up and join my club. I'll guarantee you that "Project Overload" doesn't get any better with age! I've been making quilts since 1976, and the want-to-make-list never gets shorter. You just cross off one when a "better one" comes along to attract your interest! Sorry to say it, but we'll never live long enough to do them all... though I do imagine heaven as one big fabric room with all the notions and tools I need to make quilts for everyone who's there with me! great minds and all...I just posted about finishing a project but how I really want to get back to having only 2 or so projects going. 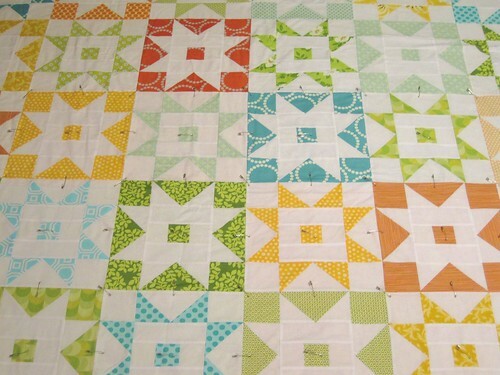 But then I listed at least 7 quilts I have started...and there at least 3 more that I've thought of. No, make that 4 more...just thought of another one. We'll come out on top! And it will be nice and cushy because there will be a pile of quilts below us! I think you need to come and join my Finish It Up! Challenge! Love the quilt! The colors are just beautiful. Nice, nice job!